One of the most talented filmmakers working today, Ang Lee has had a fascinating career. While most directors of his skill usually settle into a distinct aesthetic, Lee remains something of a chameleon, jumping genres and subject matter, apparently content to take on whatever stories happen to capture his interest. From "Sense & Sensibility" to "Brokeback Mountain" and the underrated "Hulk," I can't think of a filmmaker with a filmography as varied. Now Lee brings his unique sensibilities to adapting Yann Martel's best-selling, Booker Prize-winning novel, "Life of Pi," transforming the metaphysical adventure tale into a visually stunning 3D epic work of art. 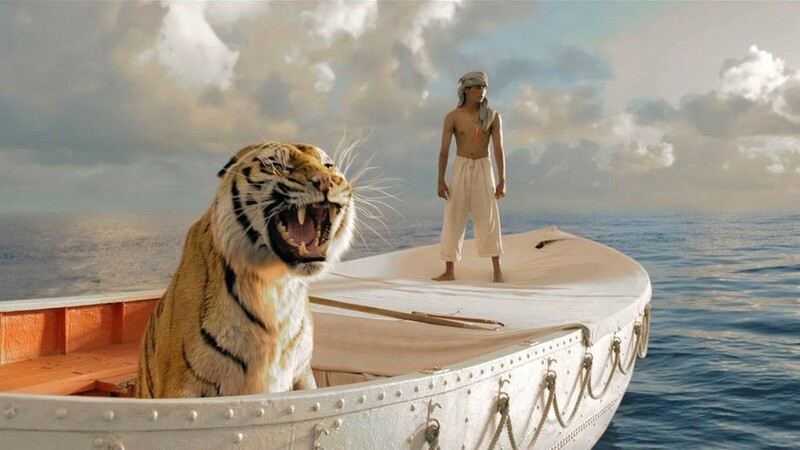 Richard Parker and Suraj Sharma in "Life of Pi." A middle-aged Pi (Irrfan Khan, "Slumdog Millionaire") narrates his story, speaking to a young writer who is keen to turn the man's astonishing life into a novel. The conversation between the two men frames the main plot and we return to their conversation throughout the film. Pi begins by describing his childhood in Pondicherry, India, where his family owns a zoo within the city's botanical gardens. Raised Hindu, Pi is a thoughtful child, filled with a spiritual curiosity that manifests itself as an obsession with exploring various religions, including Christianity and Islam. He connects with specific aspects of each, picking and choosing the ideals that most speak to him and crafting a faith that is uniquely personal. His intense spirituality occasionally puts him at odds with his more pragmatic father, but it's this faith that will eventually allow Pi to survive the hardships he must endure. When Pi is a teenager, his family is forced to sell its zoo and leave the country. Taking many of the animals with them, they board a Japanese boat setting sail for Canada. Tragedy strikes several days into the journey, and an immense storm sinks the ship in an awe-inspiring sequence rendered all the more harrowing in 3D. Separated from his family, Pi manages to climb into a lifeboat, where he is able to ride out the storm. It's not until the weather clears that Pi discovers, to his horror, that his family's Bengal tiger — dubbed Richard Parker — is also aboard the boat. The majority of the film takes place over the course of the 227 days that Pi and Richard Parker are adrift in the Pacific Ocean. The journey begins as an intense tug of war as man and beast size up one another. It quickly becomes clear that neither beast nor boy has any plans to leave the safety of the boat, and slowly a mutual respect emerges, as boy and tiger learn from one another, each adapting in their own ways to their newfound situation. Newcomer Suraj Sharma gives a marvelous performance as teenaged Pi, vital in a film in which he's basically alone onscreen for the majority of the running time. It's all the more remarkable considering he doesn't have a single previous acting credit to his name. His major co-star, Richard Parker, is an astounding digital creation that is never less than completely realistic, and one that manages to reinforce one of the film's central ideas, that all animals have souls. You never doubt for a minute that Sharma is stuck in the middle of the ocean with a wild, and sometimes bloodthirsty, jungle cat. Ang Lee's artful use of special effects allows him to depict awe-inspiring sights, including all manner of sea life, a fleet of beautiful bioluminescent jellyfish, and a mysterious island populated entirely by meerkats. He also constantly shifts the ways in which the ocean itself is presented, at times as a smooth pane of glass reflecting the bright clouds above, so that Pi appears to be surrounded on all sides by the heavens, and alternately as dark, deep, and dangerous. It's a brilliant decision, and prevents the film's stark setting from becoming monotonous. Under Lee's assured guidance, the use of 3D never feels like a cheap gimmick and, like Martin Scorsese's "Hugo," it demonstrates the possibilities of the format when a masterful filmmaker is given a new set of tools with which to tell a gripping story. Here it's used as a means of further enveloping the viewer within the story's fantastical world, though Lee isn't above milking the 3D for effect (be prepared for plenty of tiger flying at your face). Like the novel on which it's based, the film functions as an allegory about religious tolerance and man's relationship with God, and Lee doesn't shy away from the spiritual side. But don't let that scare you off. Whatever your feelings on faith, the film's thrilling story of survival and stunning visuals more than qualify the film as one of the year's best.